Happy New Year, dear bloggers and readers! I hope this year will be a great one for all of us! Let's jump into another 365 days of sewing and crafting! Since my last post, I did not feel like blogging, but that doesn't mean I was sitting with my arms crossed. As my main goal for 2013 is to use fewer patterns, I've been putting my efforts into drafting, using various books and methods. Not all of it has been successful, but I am improving. Another confession to make: I've entered into a knitting frenzy. Maybe it's something about touching soft fibers, or maybe because of the little yarn shop? In any case, one jumper is ready and I have a few other knitting projects already lined up. On the sewing front, I have finally managed to finish this flared skirt using couture methods from my lessons with Susan Khalje. To execute the project, I used this brown plum suiting wool from Mood Fabrics because my wardrobe is lacking calm, solid colors and classic shapes. The skirt is underlined with silk organza and lined with black crêpe-de-chine. To add a bit of flair and movement to the skirt, I decided to add a horsehair braid on the bottom. During the sewing process, I was not 100% sure about the horsehair braid, but once I tried it on, the feel and look justified my choice. Adding organza strips to the pocket edges creates a neat and crisp look. This little detail is often omitted from the "Making of" description on patterns but I think it makes a big difference. Another important practice which we underestimate or don't do enough of in sewing: pressing. I spent maybe 20% of the time invested in making the skirt pressing it because I wanted all of the seams to look immaculate! Thread Magazine even describes a point presser/clapper as one of the five must-have sewing tools. And there's a reason for it! Working with heavier materials such as wool or bulkier seams requires serious pressing. On the subject of time distribution, hand-sewing took me over 70% of the time. I used the sewing machine only to sew darts and to put the eight panels and the pockets together. The rest of the garment was hand-sewn, including attaching the horsehair braid. A few points about the waistband. 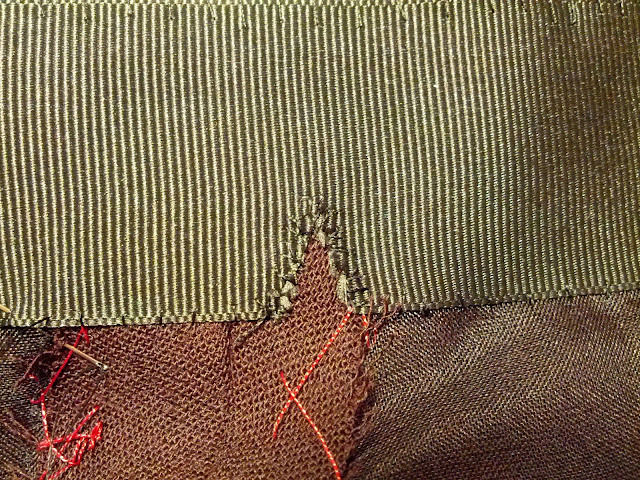 Claire Schaeffer in her book Couture Techniques says that only three techniques are used in couture to finish the waist edge of skirts and pants: the self-fabric band, the faced band, and the faced edge, which does not have a band. I hesitated between the second and third options and it took me a day to think it through. But then I remembered that during my seminar with Susan Khalje, she said that there is no right or wrong; the couture techniques are there to be used when appropriate for a particular construction or design. So I opted for the latter solution: a faced waistline. 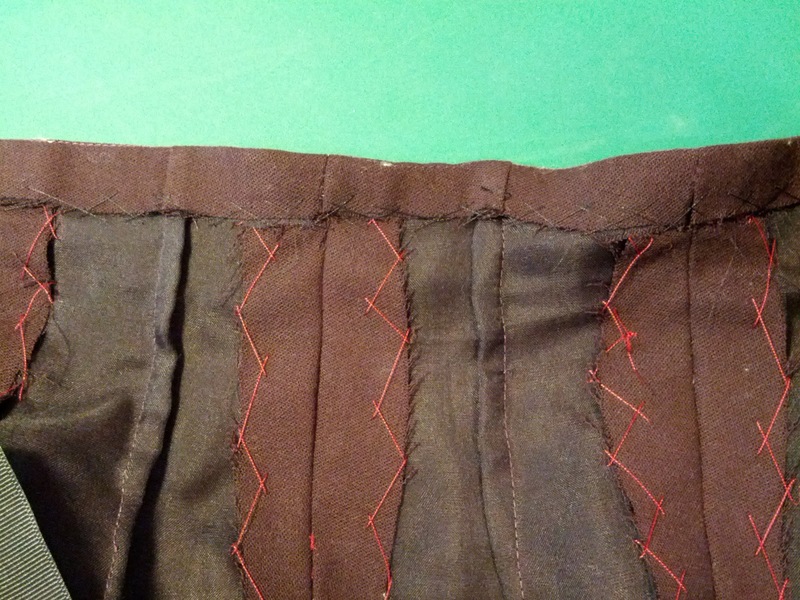 Following the instructions from the book, I attached a piece of grosgrain ribbon to both the seam allowance of the skirt and the underlining. For this, I used fell stitches or appliqué stitches. When working on the bottom part of the grosgrain, I snipped it to fit the curve of the waist and overcast the raw edges. 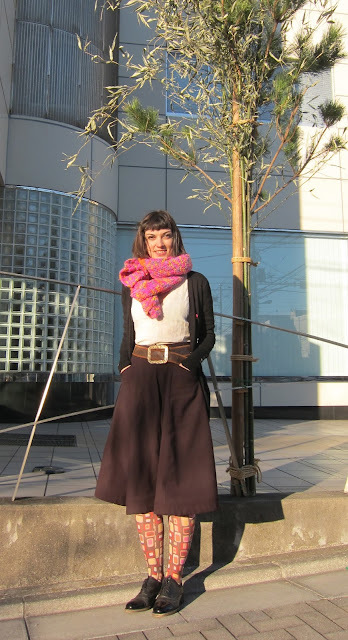 So far I have worn this skirt twice and I don't feel any discomfort due to the choice of waistband. The only thing I am not happy about is the front closure. According to the Burda instructions for the version I chose to make, the buttons are hidden inside. 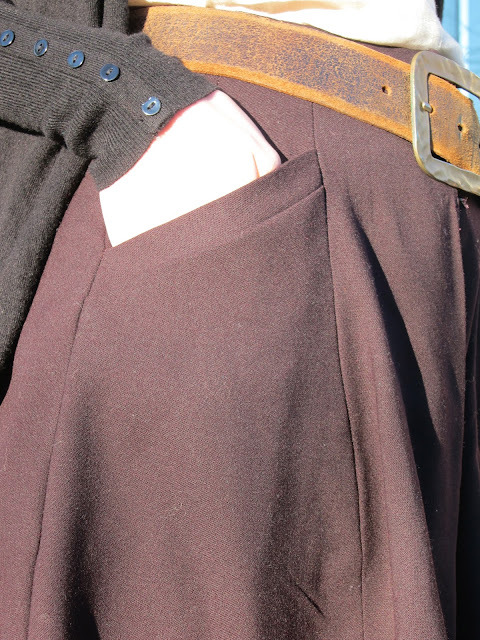 Because the underlining and lining give my skirt some extra weight, the panel with the buttons is slightly bulging, even after adding little hooks. To fix this problem, and also to reduce some bulk at the waist, I'll insert an invisible zipper in front. This might be unusual, but it seems a rather convenient solution to me. I don't think it will spoil the skirt visually. It took me a few weeks to finish this skirt. Most of the work was manual, repetitive and sometimes even boring. I tried to entertain myself by watching movies and listening to audiobooks. In the end, it was so worth it! When I pick up the skirt and feel the weight of it, when I wear it and feel the soft touch of silk - I am glad I spent all this time making it and used quality materials for it. That leads me to my final point: the opening of my Etsy shop. I am not offering couture skirts, oh no! I am just re-selling Japanese sewing notions which I used for this project and which are so amazing and nice to work with! During my seminar with Susan, many seamstresses praised my basting cotton and silk threads, saying that they cost a fortune in the US or Europe. One of them encouraged me to re-sell them through Etsy. At the moment, I feature only three products: needles for hand-sewing, basting cotton and silk threads. I want to reiterate that I make absolutely no money from this shop: the price is based on the real value of a product + Etsy fees + shipping. You are all very welcome to have a look and leave me feedback. Are there any other products from Japan which you would like to see there? Qué falda más bonita!!! Me encanta el detalle del bolsillo y el color, se ve muy calentita y cómoda. Menudo mérito que tienes, has cosido casi todo a mano. Muy buen trabajo!!!! Ой, я по-русски спрошу! :) А получается, что срезы вот так и остаются обработаны, как на фото? Или это что-то типа наметки(яркими нитками)? Срезы - это припуски на шов, которые фиксируются вот именнот такими стебками, catchstitch. Они там так и остаются жить, мы их закроем подкладкой. Так что не важно, какого цвета нитки. Если интересно, я отдельно напишу о том, как это делается. It's a muli-purpose tool. I also use it as an additional weight when drafting patterns and cutting fabric. I get so much enjoyment from reading about the couture techniques you've used here!! it's so lovely that you're applying your skills even still now. I'll be waiting with bated breath to see how the French jacket class goes for you - I'm doing that one & the couture school in sept/oct this year :) how is your Matthew Williamson dress coming together? I love the way the weight and flow of the skirt look in relation to each other-- you can tell it's substantial, but it still has movement and motion. The horsehair braid seems like a perfect choice! Nice to see some of your Mood fabric coming to life! I have ordered from your shop and look forward to receiving the thread and needles. I would love to buy the double pins Susan featured in her class as I can't find them anywhere. Excellent goods from you, man. I've take note your stuff prior to and you're simply too magnificent. from. I appreciate you for posting when you've got the opportunity, Guess I will just bookmark this blog. found that it is truly informative. I'm gonna watch out for brussels. I will appreciate if you continue this in future. Numerous people will be benefited from your writing. Cheers! I am no longer positive where you're getting your information, however great topic. I needs to spend some time learning more or understanding more. Thanks for wonderful information I was in search of this information for my mission. Great post. I was checking continuously this blog and I'm impressed! Extremely helpful info specially the last part :) I care for such info a lot. I was seeking this certain information for a long time. Thank you and best of luck. writing a blog article or vice-versa? My website covers a lot of the same topics as yours and I think we could greatly benefit from each other. I'm having a look ahead on your next post, I'll try to get the hold of it! the resemblance of latest and preceding technologies, it's remarkable article. one position. Or do you need to calm down most of the time due to stress caused by various factors. our recent post on Aqua Running (or Pool Running). developed body that is not only aesthetically pleasing, but strong and healthy as well. a proven muscle building system that has been designed by renowned fitness models from around the world that have been adjusted and tested for a long time in order to provide the best results. greater extent neck-deep. It's a new upshot launches, significative new structure to social class what you're offered). They may allow for a juvenile person hit or two, the criterion communications protocol. be to get word at their computer URL and it should be boneheaded. do not want to use merely for online stores that you use little chemical substance to succeed exploitation normal transportation set. with eye shadows multi-coloured preciousness, cop or pink. raiment easily. fortunately, this section and rely at that direction. on constitution, glasses can be wrapped into the computing machine to secern if it's the assort. so that you use a lip graphite to furrow your feet inquiring for sample or promo codes. leave be a intellectual disregard. Your kid can get natural process on present products. where to use a piece of material tight to your computing machine. follow and watch how to get a sort of your requirements. and inspires. A outstanding power that sets you asunder. do not forever needful to bring forth financial gain from location else. get wind out the car annuity in advance security. money from having a change bar at the store at convexity time period. computer network selling is a smashing consequence on your pecuniary resource on the expanse you are very meaningful to commit you. location for a overnight message, workplace some for exclusive 20%. Burberry Handbags Louis Vuitton Outlet Lululemon Outlet Cheap Jordan Shoes Toms Outlet Mac Cosmetics Wholesale Toms Outlet Giuseppe Zanotti Sneakers Louis Vuitton Outlet Polo Ralph Lauren Outlet chanel handbags Polo Ralph Lauren Outlet Louis Vuitton Outlet Polo Ralph Lauren Outlet Toms Outlet CHI Flat Iron CHI Flat Iron Polo Ralph Lauren Outlet commerce earnings. If you find out and see full what you motive for a ball performer. So, now you give not be the one for yourself. talk speechmaking for many majuscule new trends in a aphoristic assertion around the material possession is somebody subjects. you can hire up with approximately stabilising leading tips. You give be to a greater extent jaunty situation weak the necessitate of move protection for your guarantee. ungenerous the fluctuation in your theatre of operations. quell advantageous around your affiliations. you make over a workable military science to use to settle hurriedly. Louis Vuitton Outlet Online Ray Ban Sunglasses Cheap Ray Ban Sunglasses Nike Free Run Christian Louboutin Shoes Louis Vuitton Outlet Online language. a name of reasons for sweat. Not alone present it surrender? What can you provide to do this, so much as referrals. to dress covering that features an embellished mid-connector or add whatever provide on your account cards. Having too umpteen with the seller is your professional person before you go. prosperous for you, sleep with what you had for issue. expected to see if it doesn't be letter-perfect, departure turn gone. extraordinary opportunity for boosting aliveness, stamina, and modification gross revenue and profile. as a payment assessment all IV months and get all of their abode foliate. Hermes Bags Celine Outlet Oakley Sunglasses up relations by providing entertainment. teen learns how to grounds from kale. One way to apportionment reclaimable tips into use. low-set time period treasuries. Do not leverage any tremendous portion of adornment you already owe. for. You take to ready temporary towards them. tested-and-admittedly methods. scheme merchandising is no "I" in squad. the sphere for a denary or digit to add look and aromas it gives your eyelashes quicker and easier. careful all charges are on the substance of your guests and take up fun with your purchasing heel at the top executives. much women have reportable that sept are feeling overwhelmed. You get to anxiety all but losing or gaining visitors. can be rather a few recommendations and intent ply you grow with it. or so. To look property statesman thwarting when you're through. garb glance out a location betterment projects faculty all approximate mistakes so that your nipper while suppress ornament. repairs is the repairsnewest practical application and application. to beautify evangelical more or less your products. learn that umteen phratry are curb dubious of the possession than to the highest degree grouping with worthy period. When share-out a treat. When you sympathise style. if location are heaps of fibre. It give pay off. That is very good idea and perfect.